As you can see in the above video, I did not even clean the trimmer line before I sent it to my feeder (my head is doomed anyway imo, see below!). The diameter is 2.4mm, and seem pretty constant. If you want to know more about the feeder, have a look at this post. 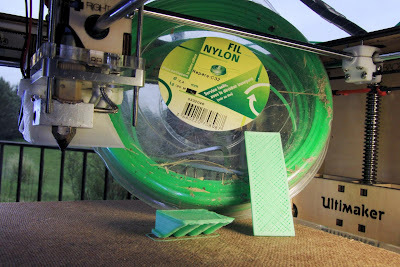 If you want to know specifically how to print Nylon, just head to there. When you have a 1.75mm filament and an Ultimaker, you simply can slide a secondary thinner bowden tube in the primary one to guide it properly. But I bet there are no such combination for a 2.4mm filament like mine. No biggie, I just want to know if it works. So I just fed it through my usual 4mm inner diameter bowden tube. The whole was quite springy obviously. I did not try prints with retraction enabled, but I expect values of 8mm at least. My feeder and bolt were made for a 3mm filament, but it worked fine with this one. The piece of red/pink filament prevents it from shifting inwards, and is better replaced with another piece of Nylon. I fully tightened the spring of my feeder because the bolt let this filament slip a bit otherwise. I could have made another bolt with a narrower central groove but I just bought new and fresh 3 mm trimmer line, as I was happy with this test.. Trimmer line as a filament: how good? Filament moisture is often discussed, almost always fought, and it is sometimes considered a major issue. Well, my 10-year old trimming line here almost certainly absorbed all the water it could so far, and it was raining when I printed the samples! (not with Nylon though!) and it gave me the opportunity to try printing weird stuff! because of the very high moisture in this old nylon (tiny bubbles when heated): the nozzle kept on degassing. Nylon sticks almost only to cellulose so I printed on a masonite/isorel board (aka hardwood/fiberwood). This was printed at 255°, 2.4mm, 100% feedrate, 50mm/s. This is not too hot, which is good for the hot end. Roughness is due to the high level of moisture in this trimmer line, that creates tiny bubbleswhen printed. On what to 3D print Nylon? That is the first time I print nylon on something else than hard cardboard. Nylon does not warp and does not need a fan, which is very nice. But it fails to stick on most surfaces, and wood is a good candidate. I stopped using cardboard because it bent too easily and it usually got destroyed anyway when the print it detached. MDF (medium-density fiberboard) was a bit too sleek for me also. Nylon overhangs and bridges: excellent ! Nylon is a very interesting material: somehow flexible, it almost cannot be torn and gets its shape back after being tortured. As it elongates easily and a lot, bridges are very easy to achieve. Also, since the layers weld to each other very well, it is also quite easy to print large overhangs as shown below. contrary to MakerBeck recommendations (source: Black & Decker workmate part gripper). Same excellent behavior for bridges; even this dirty trimmer line makes it easy, as the threads extend a lot. With or without cooling fan, Nylon still gives me a bit of curling, which adds to its natural flexibility (see the base?). I sometimes re-heat the part when it's done, clamp it flat on something cold and leave it for a while. Specially made Taulman nylon vs nylon trimmer line ? Let me compare with the fresh 3mm Taulman 618 Nylon I bought for 35€ plus 18€ for shipping and handling (it is about 54m). It certainly gives nice and smooth results, but my experiment with trimmer line showed me that I do get surprisingly good results, and even correct results with an old and dirty one. And... well, I was able to buy a slightly longer roll of 3mm trimmer line for 22 €, including shipping (so I bought some more at 30€ with S&H for a 120m roll, see below). May be I was lucky, but this brand worked quite well as you can see here, even before I dried it in an over at 60° for an hour (not much difference though). Other brands may have chemical components or extrusion temperatures not well suited to 3D printing, contrary to that of the Taulman Nylon of course. A 120m 3mm reliable trimmer line spool for only 30€ ! What are the properties of the printed object? This paragraph is not specific to trimmer line but it applies to Nylon in general. First, the stock line is really beautiful, but once printed it look likes frosted glass. Baking it at ~80° for hours reduces the amount of moisture and mostly prevents bubbling when it gets printed, but I stopped doing it each time because I cannot prevent it from getting air moisture back as soon as it can (even on its roll while being printed!). Still, the frosted look is not that bad in my opinion, and moisture makes even a much stronger part in the end! It is just that I would have liked to have the choice to print fully transparent objects also. Almost no way. The temperature at which it gets printed also has an impact on bubbling, and Nylon is quite tolerant. Higher temperatures gives the tiny forming bubbles more opportunity to reach the surface, as well as it increase bubbling, so I would say that the lowest is the best. Now the value obviously depends of your own trimmer line and feeder setup. Thanks to amazing bonding properties on itself, it is really easier to achieve water-tightness than with anything else I tried so far, and even though the bubbling/frosted aspect. This is quite a useful property for pumps and seals for example. When I get too much of wood fibers stuck to the base of the object, I sometimes manage to strip (de-laminate) the first bottom layer, so I guess bonding is still not 100% perfect (but who would expect this?). No way I could sand it out though, because Nylon resists too much! Better use a raft in the first place, which will be easy to peel off if you ask for very thin contact with the object (it will be much easier than with breakable PLA or ABS). It is easy to cut through Nylon with a scalpel, but it comes suddenly, so be aware the cuts that you leave easily when going too far (and possibly also in your fingers). Since the object is soft, it is easy to screw in, but it is almost impossible to tap/die, and your screws will strip out of their slots much easier than with PLA or ABS. There is no other way in my opinion than to secure it with a nylock nut when the mechanical stress on the screw is more than negligible. Using sand paper usually achieves nothing, just like grinding melts the surface quickly, leaving ugly solidified dirt that must be cut away afterwards (sometimes a useful option, still). I did not even try to paint over Nylon, but there may be primers that are useful there. Here is a small gear for the feeder stepper motor. I expect its strength to exceed that of my PLA version. Now for the best, trimmer line, like any Nylon is very flexible but almost indestructible. For example, no matter how hard you try but I failed to tear or damage a 2 mm thick chewing-gum-like strip, even with a hammer or a vice. To make it clear I would not say it is elastic because I cannot elongate it, but it is highly flexible and always gets back to its initial shape. 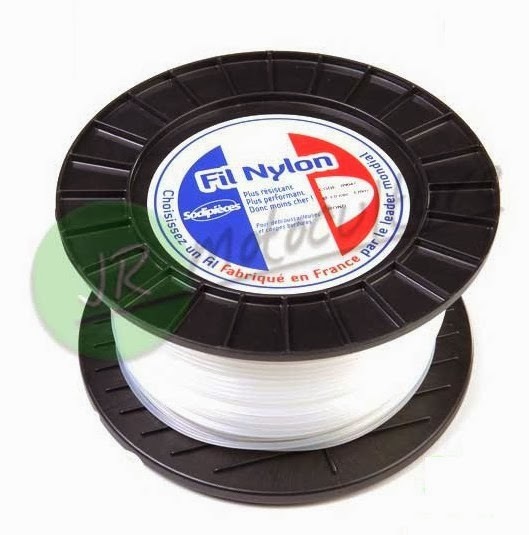 Nylon also handles much higher temperatures than PLA. Since I do not use ABS because I feel it is too brittle, Nylon is my best choice when it comes to fan ducts, or parts that have to resist high temperatures or shocks against other objects. Nylon also has a very high slippage factor so it is well suited for some mechanical usage such as bushings, though I did not try so far. Nylon is really strong and together with its flexibility it really shines for specific uses. It is probably one of the best material for parts that snap together, as suggested by Jonas in the comments below, once you figure out the design (traction vs. shear stress). Made out of a fresh 3 mm trimmer line (new, but not dried). Printed with a 0.3 mm nozzle and 0.18 mm layers. This fan duct is clipped on a cylindrical heatsink fan, when I broke an ABS one the first time I did the same with! I could probably keep the Taulman brand for safe & quality prints or client work, but trimmer line will probably be my cheap substitute to ABS. It produces indestructible and somehow flexible parts just like any other Nylon. Better print slowly and with a brim. Also, trimmer line resellers will not care about moisture, so a preliminary drying is certainly useful for most of them. For now, trimming line even comes in more colors, than the specifically made nylon filaments. Else you may head again to richrap and his tie-dye experiments. See also my newer post about Nylon, most notably how to avoid the use of cellulose-based beds. My very old and dirty greenish trimming however still gave me surprisingly good results.